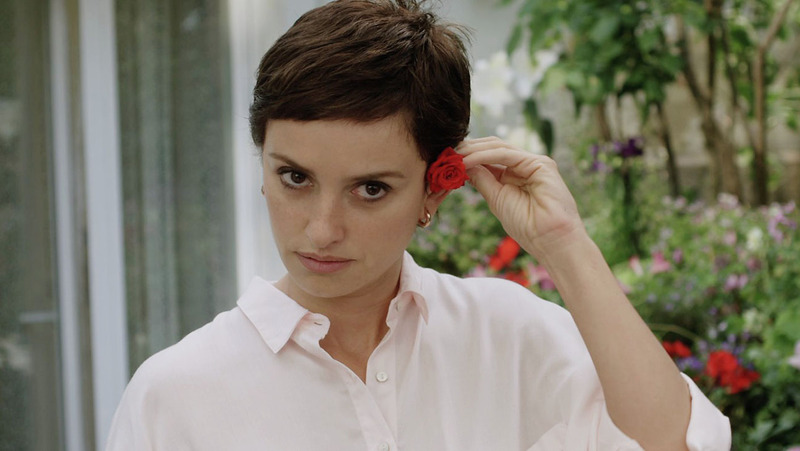 Laura Morgan is both dazzled and underwhelmed by Penelope Cruz’s latest film. I like colours in films. One of the increasingly long list of reasons I don’t watch Tim Burton films any more is that I am irritated by films which are theoretically made in colour but which confine themselves almost exclusively to shades of grey. The UK poster for Ma Ma, Julio Medem’s story of motherhood, love and breast cancer – the poster you’ll have seen on the Underground in recent weeks if you’re a commuting Londoner – is a hearty red. This is entirely misleading, since Ma Ma is almost entirely without colour, both visually and figuratively. There’s a scene, pictured above, where Penelope Cruz’s Magda wears a red flower in her hair, and once we see her in the sea, in a red bikini. There are moments where the principal characters – Magda and her footballing son Dani; Arturo the football scout facing his own tragedy; Magda’s inexplicable singing doctor – seem to commit something resembling human emotion to the screen. But both are rare enough to be noticeable. Mostly, this film floats along on a gauzy wisp of something that sits uncomfortably between stylised make-believe and cloying sentimentality. Magda, abandoned by her lecturer husband in favour of one of his students, discovers in the film’s opening sequence that she has breast cancer. Stoically deciding to go it alone, she sends her son Dani to stay with relatives while she undergoes treatment. In the meantime she has met Arturo, with whom she forms a tentative friendship even while he is in the midst of a crisis of his own. In the made-for-TV version of this movie Magda would be a heroine; uncomplicatedly someone to root for. In this (slightly) more interesting version we also get to see a self-indulgent, wilful person who lets herself be vain and scared as well as brave, though if that sounds as though I’m endorsing the film as anything like a realistic depiction of what living with cancer can be, please be clear that I am absolutely not. This film is fantasy, pure and simple; and the faint-hearted could be forgiven for feeling a little queasy at its choice of something that is so solidly and uncompromisingly real to so many of us as its starting point. That said, it doesn’t take long for us to sweep firmly outside the realm of lived human experience. A sub-plot which relates very tangentially, if you squint, to the denouement of the film, kicks in early on and simply makes no sense at all. It involves Magda’s doctor Julián, played by Asier Etxeandia who does a good job with an impossible role, wrestling nobly with a part that seems to be an amalgam of three or four characters, none of whom belong in this (or any) film. The sub-plot itself is too silly for me to go into, and in any case it never goes anywhere, but that is by no means the limit of Julián’s unlikeliness. I will admit to not knowing the intimate details of the operations of the Spanish healthcare system, but I hope all their doctors are like Julián, who appears to be not only a GP but also a consultant and a surgeon. Of course, this is because Julián isn’t a doctor, he’s a cypher for a doctor-figure, the knowledgeable protector who will guide Magda through her darkest and most fearful moments (as well as turning up to serenade her on holiday and give her a medical examination in the sea). And that’s fine: the film is a fairytale, a metaphor for love and loss and change, it doesn’t have to be realistic. But if you’re going to do metaphor, you may as well go in hard. Ma Ma has the aspect of a dream, but the kind that didn’t really make any sense and so you forget it a few minutes after waking up. It looks good, and Alberto Iglesias’ score gives it a substance it really doesn’t justify, plus there is a whole lot of Penelope Cruz (who also produces) looking ethereal and composed and stunning in all of her various states of health (did I mention it’s not realistic?). And Luis Tosar is good as Arturo, the only character who seems at all convincing as a person, although he tends to get slightly shunted to left-of-centre every time anything actually happens, despite being the male lead, the main love interest and the person to whom the most things happen. But while those positives are enough to make it a diverting way of spending 110 minutes if you have nothing better to do, they are not enough to pull it together and make it work as a coherent whole. Too mawkish to be arthouse, too contrived to be mainstream: the IMDb describes Ma Ma as “Drama” but it’s not; it’s pure, unashamed melodrama. Ma Ma is in UK cinemas today.